Spray foam is one of the most versatile forms of insulation available because it will seal your home from air, moisture, strengthen your building’s structure and provide thermal, air and vapor barriers that can withstand all different types of climates. Spray Foam insulation outperforms all other forms of insulation by large margins because the long-term benefits far outweigh the initial costs associated with regular installation. Instead of having your walls layered with fiberglass that can flatten over time and be hazardous to the touch, spray foam stays in place and is cost effective. 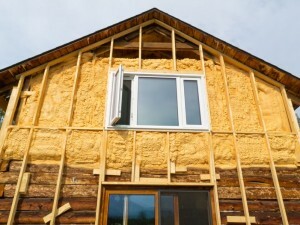 Many contractors are calling this method of insulation a greener alternative and are satisfied with how effective it is. Closed Cell Foam can double the strength of your walls and act as a glue by holding your roof and sheathing in place during high gusts of wind. Spray foam insulation is the future of insulation. Advantages exist for financial savings, health, building efficiency and greener environment. One great advantage of spray foam insulation is it’s easy application. It is becoming more apparent that utilizing spray foam insulation to seal and insulate a home is quickly replacing the outdated method of using pretty pink fiberglass to complete the same task. The advantage of spray foam insulation that immediately grabs most people’s attention is the savings. Although it costs up to three times more to initially install, the long term savings associated with foam insulation far out way any cost differences. Spray foam insulation appeals to contractors due to the time it saves. One application is all that is required in order to seal and insulate. And, since, it does not settle, there is no need to re-apply. Improved air quality and noise reduction are two other benefits that accompany spray foam insulation. Finally, spray foam insulation can literally save your home as it is insect and fire resistant. A benefit anyone would want. All of these qualities make spray foam a great choice when insulating a home. The only drawbacks are that it can be quite messy and is best installed in new construction. However, with certain modifications and precautions, it can be used in remodeling projects.